Joomla 2.5.0 was released on schedule on January 24th and since then has been updated to Joomla 2.5.1. Initial teething issues have been addressed and the new version is very appealing with several new features and time savers. Updates from Joomla 1.7.4 to 2.5.0 that I tried using the built-in Joomla update utility failed but these issues were anticipated by Nicholas Dionysopoulos and addressed in his excellent Akeeba Admin Tools. Even the free version handles the upgrades flawlessly. Nicholas has offered to help incorporate his code into the core of the next Joomla 2.5 release so let's hope that his offer is accepted. Update: As of Joomla 2.5.4, Nicholas's code has now been incorporated into the Joomla core update feature. Assuming all your favourite extensions are Joomla 2.5 ready, now seems to be a good time to upgrade from Joomla 1.7 or migrate from Joomla 1.5. I have been busy updating my personal and business websites to Joomla 2.5 and have completed my first client migration from Joomla 1.5. It was easier than I thought. The trickiest part has been relearning all the cool tricks I had learnt in ChronoForms v3 as ChronoForms v4 has been completely rewritten and is even better than before! Remember that Joomla 1.5 security updates will only continue to September 2012 so Joomla 1.5 website owners should be thinking about migrating at some point this year. Joomla 1.5 websites will, of course, still operate after September but may be more vulnerable to hackers. There have been some repercussions for some of my Joomla clients after VentraIP updated their server fleet to PHP version 5.3.9 this week. Clients with older versions of JCE Editor found that some features (e.g. spell checker, insert image) would not work until JCE Editor was updated to the latest version. To further complicate matters, once JCE Editor was updated to the latest version, this caused issues with older versions of AcyMailing. This too was easily fixed by installing the latest version of AcyMailing. If there is a lesson to be learned from events this week, then it is worthwhile conducting a regular review of your website and ensuring that extensions are kept reasonably up to date. This is also the best way to keep your website safe from hackers. Let me know if you'd like a free review of your Joomla website showing your extension versions compared to the current extension versions. I have a myJoomla subscription and can now monitor Joomla clients websites for out of date extensions, out of date Joomla versions and also for malware. I am subscribed to the Joomla Vulnerable Extensions feed and when a vulnerability is announced, it is very quick for me to check which websites are affected and to update them. Joomla has won the 2011 Packt Publishing Open Source CMS Award ahead of Drupal and Plone. This is the third time that Joomla has been honoured with an award since the Packt awards started six years ago. Joomla released new versions 1.6 and 1.7 this year and has been downloaded over 26 million times since counting started in 2007. It is estimated that Joomla now accounts for 2.7% of the world's websites from small personal websites and blogs to government and multinational corporations. 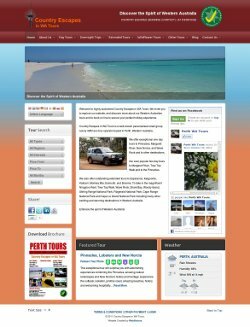 The new Perth WA Tours website was launched today. It has been created using Joomla. A customised version of the Modulus template from RocketTheme has been used for the web design. Web development includes a tour database created using "ChronoForms". Tours are entered via an admin only option once the administrator is logged in to the front-end. The website automatically creates the menu options and calculates tour prices based on what has been entered into the database. Visitors can inquire, book and pay for tours online. Forms and online payments are implemented using "ChronoForms" and "Payment Form". Tours can be searched via a search form and a list of tours is displayed. Tour detail pages with individual tour slide-shows are available for each tour.